Whether you are drafting an application for college admission or for securing funding through grant proposals, writing a letter of an applicant can be a long and difficult process especially if you don’t have the right guidance as to where to start and end the application. A good application is close to a good recipe, it is made of few crucial elements and ingredients blended well together. 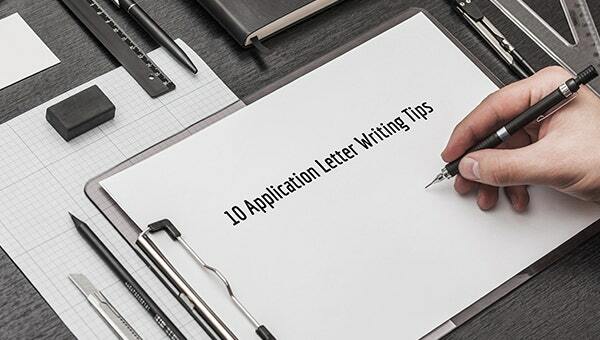 As we all agree that writing an application can be a daunting task, therefore, we have today come up with a set of 10 tips that will help you succeed in writing an application letter for a job for any given purpose. It is important to understand that you read and fully acknowledge the eligibility rules, the terms and conditions and the questions mentioned in the application. If you miss out on this founding points you will not be able to move ahead successfully. Make sure that you give yourself plenty of time to prepare a convincing application that puts forward your thought in a clear and straight-forward tone. Make sure the application is subjective to your purpose and expresses your idea vividly. Make sure to not use any unnecessary jargons in your application just to make it look fancy and refined. Ensure that the language is legible and easy to comprehend for the reader. The overuse of jargons will create a negative impact instead of leaving a positive impression. It is often helpful to read your application to someone who is not a specialist in your field. As he/she will be able to tell you whether the application can be understood by a common man or not. This exercise can be of great help in both the formal and informal setups. This point and application letter writing tips might sound and look weird at the first glance, but the ‘so what’ test can help you make the application purposeful and result oriented. For every statement you have written in your application, ask yourself ‘so what’? This will help to ensure that you get some value out of every word written. Make sure not to assume anything while writing the application. You have to primarily keep in mind that the foundation or the receiving party has no prior knowledge about your organization, group or local area. What may sound obvious to you may not be obvious to them. Scan and review the left part of your application, if it is all about you, then rewrite it completely. The application should not focus on you but about your beneficiaries. Simple and precise, this tip can help you word and reword your application well. The simple application letter should always be to the point, easy to understand and clear. Remember if you try and over complicate the standard basic information, the reader will dismiss your application because of not being able to understand the content. Try and bring a group of people together who have a variety of skills and background to pool ideas and complete the application. Think about your unique selling point, what is that one thing that will increase the appeal of your project to others? Remember that many times your application will be open for voting, so make sure to include the elements that will help your application to stand out from the crowd. Although it may seem hard at first, but if broken down to the basics, an application can be equally simple to draft and understand.